Blessings, Miracles, &Thoughts in Between: Just got the call! We have a perfect match!! An amazing 24 yr old man will give Kate a second chance at life!! We will know more details after our conference with the transplant team Tuesday. Looks like transplant will be in the next 6-8 weeks!! Wow! So excited! Thank you to the self-less young man who will make our dreams come true! God Bless You! 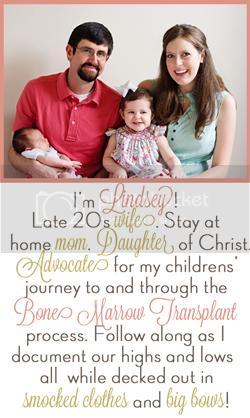 This is such awesome news Lindsey! I am overjoyed for you, Kate, and Alex! Our God is just AWESOME!! I don't know what to type I am so excited. that is amazing news! God bless all of you! OH MY GOSH!!!!! YAY!!!!! What a wonderful man. Praying for both he and Kate! Praise God!! I just got major goose bumps! I'm so happy for Kate! God is watching over her so very closely! I bet that young man feels so proud to be able to save a little girls life. He is truly an inspiration! Congrats again! I can't wait to hear how everything goes! OMG, this is so awesome! Congrats! I don't even know what else to say!!!!!!! This is the best news I've see in such a long time. I'm so incredibly happy for you. Even I want to hug that man!! I am so happy that I have tears running down my face! Please keep us updated and give that amazing 24 year old a HUGE hug for all of us! I've been following you for a while and am absolutely in tears for you. God is good! Oh wow! Praise God! This is great news!!!!!! Lindsey, that is such great news! I hope Kate gets to meet this man one day, and you can show him how amazing he is. That is awesome! So happy for your family. Lots of love your way!! Praise God! So overjoyed for your family! That's wonderful news! I'll be keeping you guys in my thoughts & prayers in the upcoming weeks for a successful transplant and a speedy recovery! It's so good to hear this, Lindsey. I'll praying every thing goes as smoothly as possible. I just found your blog through twitter a couple days ago. I've read through your archives and just fell in love with the pictures of sweet Kate. I am thrilled that a donor has been found. You and your family will be in my prayers. Hi Lindsey! I am so thrilled to hear this wonderful news. I have been praying for Kate and your family and now am praising God for this amazing blessing. I will continue to keep your family in my prayers and will add this 24 year old man to my prayer list. What a wonderful, selfless person. A true blessing. The power of prayer is amazing. SO SO happy for you guys and little Kate. What an absolute blessing this is!! That's wonderful news!!!! Praise God!!! What wonderful news. Your family and this young man will be in my prayers! I have been thinking of you guys so much. What great news! Continued best wishes to you, Alex and Kate. That's AMAZING.news! Congratulations and here's to hoping everything that comes along with this goes smoothly! SO very happy for you guys!! You are still in my thoughts. Wow! How exciting! Just the first sentence made me tear up! I am so beyond happy for you all! My thoughts and prayers are with you guys in this long process. God is Good! One of your fellow special needs moms from thebump.com..... so excited for you. Praise God!!! You've been in my thoughts and prayers for a while now. I'm so happy for Kate, you, and Alex. Thank the Lord! Just got a few tears! So thankful and happy to hear! What a blessing from God! Just came across this site and am crying and praying. My sweet boy was born April 2010 and almost died the first few days of his life. For a month we didn't know from day to day if we would ever be able to take him home... but God met us there! And now he IS home, thriving, and a joy every day. Praying your journey has the ending you are hoping for... and a testimony to bring God honor and praise for the rest of your days. God is good! So happy for your family and will keep y'all and the wonderful donor in my prayers! I have quietly followed your blog and I have tears in my eyes as I read your latest update. Prayers and happy thoughts to your little girl and the wonderful donor! praise god, what awesome news!!! That is such great news! I'm am really happy for you and Kate. I couldn't be any happier for Kate and your family. Wonderful news! I've been thinking of your little Kate. Total answer to prayer! Oh Lindsey, that's wonderful!! :) I am so happy for you, Alex and for Kate! What amazing news!! That is awesome. Hopefully everything goes smoothly. Your family will be in our prayers! What an amazing God we serve. That's the best news I'v heard all day. I've been stalking your blog waiting for this post! So happy for your family! That is wonderful news! God bless that young man for donating! This has made my day! I just burst into tears of joy for you!! I am SO happy to hear the news!!! Praise indeed! Thrilled for y'all! I know I have told you 2,765 times, but I can't stop thinking about you guys! SO SO SO thrilled. Praise God! Wow that is fantastic news! I'll be thinking of you guys! That's amazing, Lindsey! So so happy for you and Alex and Kate! Oh Lindsay - I'm SOO happy to hear this! Sending lots of prayers to little Kate & your family always! I am so happy to hear this news. I signed up for the registry when a coworker of my dad's small child needed one. My younger brother has been in remission for a year and a half from stage 4 hodgkins lymphoma after his. I'm his perfect match if he should need me. You are all in our prayers. Visiting from Kelly's Korner and I'm thrilled to see such fantastic news!!! I'll keep you all (and the amazing donor) in my prayers!!! I have been following your blog for a while now and I wanted to let you know we have been saying prayers for your sweet family. Kate has inspired my husband and I to register with DKMS. Congratulations on the match, and we will keep sending prayers your way. SO AWESOME! What an amazing young man that will change your lives. All of you will continue to be in my prayers. This is fantastic news! Keeping you all in my thoughts, always. Ahhhhhh!! YAY!!!! I am so happy for y'all!! Praise God!!! What wonderful news! I am so happy for you all. I just registered myself and my husband to become potential donors after reading about Kate. I've "known" you from TB since 1st tri and I think you should know you are a tremendously strong woman and mother. I can't even begin to imagine what you're going through--babies shouldn't be ill. I wish you, Kate and your husband all of the best things in the world because you deserve no less.